France will play Scotland in their final warm-up game before Euro 2016. The game will take place in Metz on 4 June, five days after the Euro 2016 hosts face Cameroon in Nantes. The friendly matches follow a trip to Amsterdam to play the Netherlands on 25 March and a home game against Russia on 29 March in Paris. 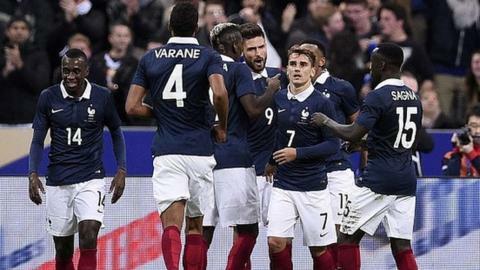 France begin their Euro 2016 campaign against Romania in the opening fixture on 10 June in Paris before facing Switzerland and Albania in group A.